Business agility rests upon a well-architected environment of business processes, workflows, and communications. 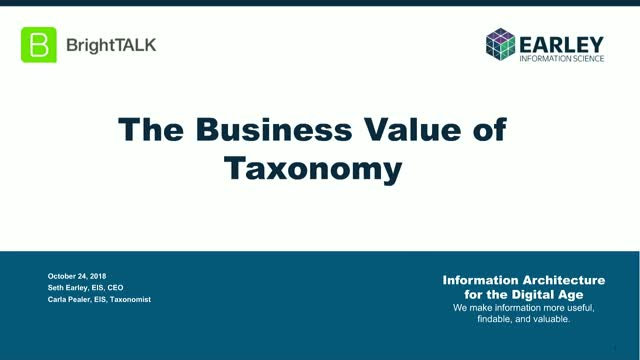 So how does taxonomy fit in? It’s everywhere - taxonomy is the foundational building block that improves efficiencies, collaboration, and cost reductions across the enterprise. And the more agile you are, the better opportunity you have to compete and win. • How taxonomy design enables customer acquisition, search relevancy, structured data, faster time to market, asset reuse, and more. As your business and product data complexity grows, so too may your need for an enhanced PIM system that accounts for numerous operating units, separate companies, global operations, and more. How do you judge whether you are ready to jump from your homegrown solution? And if you’re ready to make the jump, what is the best path to ensure that you transition from one system to another successfully? Alison Tran, EIS, Client Partner, brings over 14 years of business and technology consulting experience in technology adoption, software implementation, organizational redesign, change management and process reengineering. Chantal Schweizer, EIS, Principal Consultant, a senior information organization professional with over 10 years experience in product information and taxonomy design. In this webinar we explore how intelligently enriched product data drives growth and differentiation in the marketplace. Ecommerce websites, replacement part reference guides, online marketplaces and IoT monitoring platforms all have one thing in common. They all depend on detailed, accurate and comprehensive product information databases. Product data is a critical driver for core offerings today, and will be even more critical as organizations innovate across their value chains in the future. This webinar will be of interest to marketing, product management, service management and data management executives with manufacturers, distributors, and service providers. Also, anyone exploring the role that product data plays in defining and growing their offerings and transforming their customer value propositions. In this session our panel of experts discuss the challenges in building more powerful capabilities based on a foundation of a well-constructed taxonomy. * How are manufacturers and distributors using taxonomies to improve site search? * How are taxonomies used in merchandising – assessing product mix and grouping products for specific targets or solutions? * How do taxonomies help with personalization? * How are part relationships managed and presented? * How are multi-tiered product entity models like base-variant being leveraged to improve data management, reporting and navigation? The B2B technical buyer is a unique persona with specialized needs. In order to get and keep this valuable customer on your site you must speak directly to their needs. So, how are the needs of technical buyers defined and translated into an engaging experience? The B2B and B2C ecommerce experiences have many similarities. Some lessons learned from B2C can be valuable to B2B. However, the two markets also have important differences, and the customer journey needs to reflect them. This roundtable delivers valuable insights for CMOs, VPs of Digital, and Senior Marketing executives in organizations that operate as manufacturers, suppliers, and/or distributors in the industrial, high-tech, aerospace, life-sciences, and MRO spaces. Let’s face it - no one likes the ‘G’ word. It’s too often a sour antidote to excitement and nimbleness: Triple checks, security barriers, privacy forms, council reviews. It’s as awful as pulling teeth and paying taxes, right? Thankfully it doesn’t have to be, and many organizations have found an effective rhythm for long-term, sustainable data stewardship. Join us on Tuesday, August 28th, at 11:00 AM ET as we discuss ‘Data Governance: Achieving Sustainability Among Whiners,’ where we’ll explore how you can implement this necessary rhythm, even if you’re surrounded by governance resistors. Seth Maislin is a Principal Consultant with Earley Information Science. For more than 20 years he has demonstrated strengths in classification and taxonomy, indexing and content modeling, information architecture, search, and usability. He has dedicated the last 10+ years to providing sustaining information management solutions to clients facing real and complex findability challenges. Seth Earley is the Founder and CEO of Earley Information Science. An expert with 20+ years experience in Knowledge Strategy, Data and Information Architecture, Search-based Applications and Information Findability solutions. Seth has worked with a diverse roster of Fortune 1000 companies helping them to achieve higher levels of operating performance by making information more findable, usable and valuable through integrated enterprise architectures supporting analytics, e-commerce and customer experience applications. Whereas most Retailers have already made the leap to a digital paradigm, Grocery has lagged behind. And now, as major digital players jump into the fray (Amazon, Whole Foods,) it’s now officially ‘game on’ for the industry at large. What does it take to successfully deliver a digital experience for the B2B market? While, the whole enterprise needs to be aimed at driving a digital experience, there are 4 key areas which, if overlooked, will cause your B2B digital experience to suffer or fail, no matter how good your digital platforms or your core products are. Digital experiences are made of content, knowledge and data. In this one-on-one conversation with Matthew Clark, Premier Farnell's VP of eCommerce & Digital Marketing, EIS's Dino Eliopulos will explore what companies need to do to ensure that their product information, content, and know-how combine with insights that they have about their customers to elevate their digital experiences to the top of the industry. • Robust, shoppable product catalogue. • Optimized site-search, chatbots, and product recommendations. • Real value for shared customer information. ADP shares their successes in harnessing AI to drive engagement and information sharing with customers. The age of customer-driven, Artificial Intelligence (AI)-powered enterprises is here, and B2B/B2C companies are beginning to harness its value. Yet, while many companies are considering AI initiatives, few are provided with a clear roadmap and best practices to evaluate, develop, implement, and measure the impact of their efforts. Join Seth Earley, Founder and CEO, Earley Information Science and special guest Enid Martinez, Senior Director of Engineering and Automation, ADP, for "Why AI? A Case Study with ADP." How far along are we when it comes to digital transformation? EIS set out to discover the answer by launching an industry-wide ‘State of Digital Business’ Survey which asked respondents to share their data readiness, planned digital projects, future goals, and more. **The trends your peers are experiencing that are driving digital business initiatives within your organization. **The challenges your peers are facing when implementing a digital business strategy, as well as the tactics they’re using to overcome those challenges. **Common (and not so common) digital business initiatives that are underway within your peer companies. We hope you'll join us on January 30th at 1:00PM ET to find out "The Real State of Digital Business for 2019." Artificial Intelligence (AI) has the potential to completely revolutionize the B2B selling function. And depending on who you talk to, AI will either enable massive productivity gains from your employees or replace them entirely. Hype aside, AI is coming, and B2B companies need to understand how to harness it. And despite the promise of ‘plug and play‘ technology, real AI requires varying degrees of knowledge engineering, product and content architecture, and high-quality data sources to be effective. In this session, EIS's Bryan Kohl, VP, Business Development and Dino Eliopulos, Managing Director demystify AI for your B2B organization. Provided with access to the right information chatbots can help facilitate a new transaction or provide account support to an existing customer. Many vendors are claiming to use machine learning and artificial intelligence in their virtual assistant applications. However, the reality is, curated, structured content needs to be developed for these applications, rather than having the system ingest large amounts of unstructured content. What makes content appropriate for training? How should organizations prepare for these types of systems? How do the underlying processes that support the customer need to evolve to operationalize AI applications for customer service? Join our experts for an in depth discussion of “the next big thing” in customer experience. Join Seth Earley, CEO of Earley Information Science, and special guests Andy Hoar, CEO of Paradigm B2B and Minal Bhargava Parker, Senior Product Manager eBusiness at HD Supply, as they consider the digital trends making the news these days, and identify those that are critical to success in 2019, and those that might just be hype. We’ve all heard it – digital transformation is coming for us. From how our customers engage with us, to how our partners leverage us, and how our business operations scale, digital transformation is the ultimate goal for successful eCommerce companies in 2019. When training an AI-driven virtual assistant, harvesting and reusing knowledge assets is critical to success. A good digital experience is about facilitating information flows between the organization and its customers. Whether answering questions on community bulletin boards, self service through FAQ’s, email communications, interactions with call center agents or text exchanges with bots, the objective is to give customers the information they need to use a product, make a selection, solve a problem and achieve their overall goal. At the heart of this is knowledge in various formats. In the AI world, it is referred to as “training content” – the knowledge assets that support customers directly or indirectly. Whether training a support engineer or training an AI-driven virtual assistant, harvesting and reusing these assets is key. However in most large organizations training platforms, knowledge bases and support applications have evolved organically with different architectures, changing ownership, fragmented taxonomies and disparate approaches. Some believe that AI and machine learning will solve this problem but while these technologies are promising, not every support application and knowledge source is amenable to a fully automated approach. Even when that is possible, certain elements have to be in place. --What does the changing technology landscape mean to support organizations, call centers, and customer service functions? --Can knowledge be captured and structured for reuse in a sustainable, economically viable way? --How can the customer be supported throughout their journey by knowledge that originates in different parts of the organization? --How do processes need to evolve to provide an end to end seamless, positive experience? Earley Information Science (“EIS”) is a specialized agency with expertise in applying world-class information management to eCatalogs, digital marketing, and unified commerce – across industries from industrial manufacturing to food and beverage. EIS was founded on single belief: companies run on data, and companies that run on structured data, run better.